On June 6, 1944 the Allied forces landed at Normandy in the largest amphibious invasion in world history. On June 6, 2014 FLA is going to land in Carrabelle. WHAT IS THE CONNECTION, BESIDES THE DATE? (More on this later). Carrabelle is home to the Crooked River Lighthouse, which was built in 1895 as a replacement for the Dog Island Lighthouse which was destroyed by the “Great Storm” in September 1873. The Lighthouse is located about 2 miles west of Carrabelle on US-98. As you drive west on US 98 from Carrabelle, the Gulf is on the south and wooded areas to the north. IT IS EASY TO MISS THE LIGHTHOUSE (I SPEAK FROM EXPEIENCE! ), look for the sign inserted at the right. A 1987 book “Guide to Florida Lighthouses” did not list the Crooked River Lighthouse at all, and in 2008 the author of the book “Florida Fabulous Lighthouses” called it the least-known Lighthouse in Florida. The meeting will begin Friday June 6 at 6 PM with the FLA Board meeting at the old restaurant above the C-Quarters Marina located at 501 HWY 98. MAP with the Social following from 7:00 to 9:00 PM. On Saturday the membership meeting, starting at 9 AM will be in the same location. The Guest Speaker has yet to be determined, and will be announced later. Lunch will be your choice of one (1) of the following: 1) Fried Seafood Platter consisting of Grouper, Shrimp, Oysters and Deviled Crab with Coleslaw, Baked Potato Hush Puppies and Tea, 2) Rib Dinner – Hickory Smoked Country Style Ribs, Coleslaw, Baked Beans, Texas Toast and Tea or 3) a Vegetarian meal. Key Lime Pie will be the dessert. 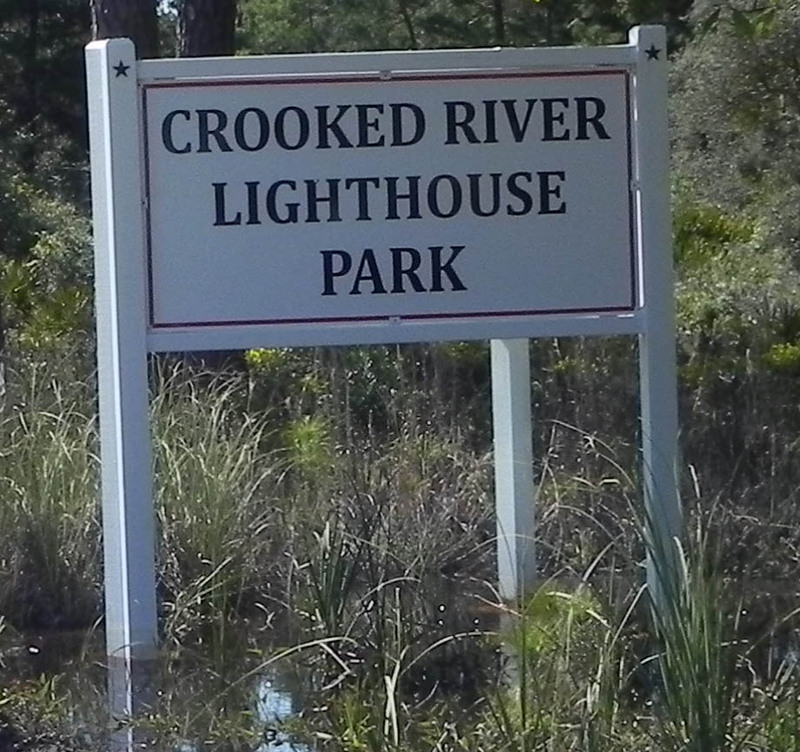 After the meeting we will visit the Crooked River Lighthouse, located at 1975 HWY 98 W MAP. Cost for this meeting will be $60 for FLA members and $85 for non-FLA members (Includes a 1 year membership in FLA). This cost includes food, wine & sodas at the Friday night Social, coffee and donuts, Danish, or something along those lines Saturday morning, lunch and the Crooked River Lighthouse. Rate – Cottages - $179 for a cottage that sleeps 6 (2 queen Beds & Queen Sofa), $ 160 for a cottage that sleeps 4 (king bed & Queen Sofa); also, there is a $ 50 cleaning fee. Thanks to a suggestion from Kathy Swaggerty of Carrabelle I am adding another lodging location for this meeting. Rate – Clubhouse Villas $110, 2BR/2BA Condominium $162.50, 3BR/3BA Condominium $212.50, all plus tax. 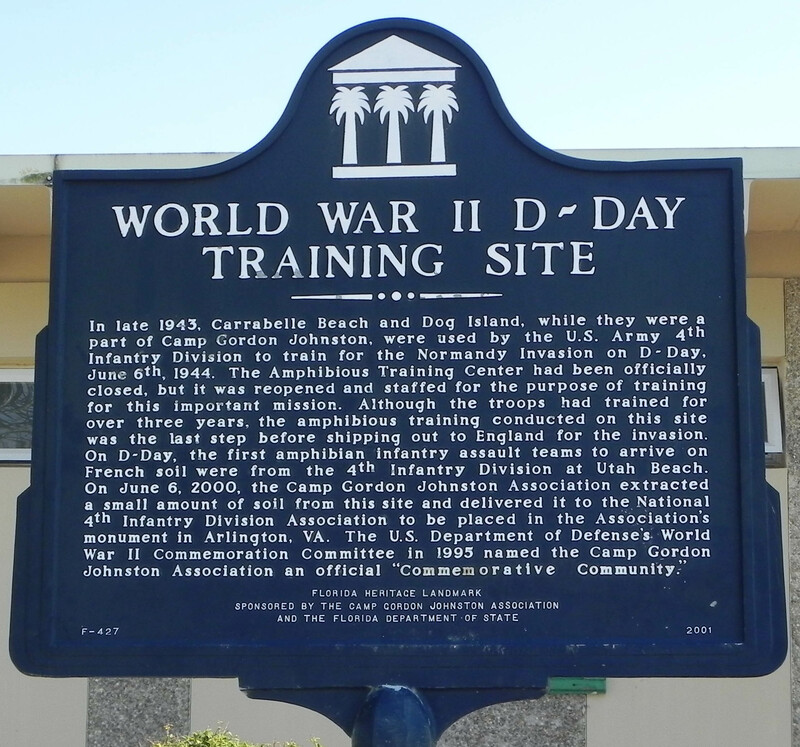 A short distance east of the Lighthouse is Carrabelle Beach, which is one of the places that were used to train our troops for the Normandy invasion.